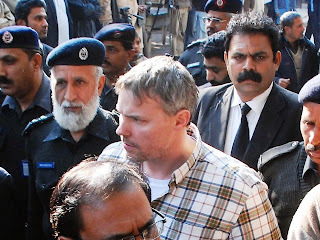 Pakistan continues to resist the American pressure of not leaving the American CIA agent Raymond Davis. America has suspended high level talks with Pakistan and also threatened to stop aid to Pakistan but Pakistan has made it clear that Raymond Davis will not be left until Courts Verdict comes. Davis is in Custody of Lahore Police which is doing Inquiry from him. Although Raymond Davis killed two men by gun but actually he has taken 5 lives. He killed two men by firing, one man by car crash, wife of one of the man that was killed committed Suicide who was also having a Kid of 4 months in her Belly. So in total 5 people lost their lives. Americans are claiming that Raymond Davis must be left because he has Immunity of being a Diplomat which is a white lie. The truth is that Raymond Davis is a CIA agent whose proofs are these. 1 He kept Illegal Weapons. 2 He was in a Private Car. 3 He came with a Fake Visa to Pakistan. 4 Photos of Madrasas, Sensitive Places, Pakistan Army found from his Camera. 5 Americans are hiding his real name. 6 He is well trained.